Dear A: 18 months old already! It has been ages since I wrote, and so much has happened in the past few months. You’re a very confident walker now and love to wander around the neighborhood, pointing out cars and flowers, and picking up handfuls of sand to let run through your fingers. Speaking of sand, you love going to the park with us and with your daycare. You like the swings and slides, but your favourite thing is to dig in the sand. You dig with a little shovel, or put handfuls on the shovel and then dump it over. You sometimes grab handfuls of sand and dump them on the bottom of the slide, and then swipe it off again. Watching you play is fascinating, and Daddy and I love seeing you discover the world around you. You started gymnastics class, and I think it’s the perfect activity for you. The first day you were a bit shy, taking the measure of your instructor and the other little boy in the class. This weekend, for your second class, you were ready to jump in and you had a great time. Your favourite part was the trampoline area, and you love throwing a ball around and chasing it while jumping around. You’re remarkably coordinated for your age, and can jump with both feet at the same time. I’m so happy that you are enjoying it so much. We don’t spend much time watching TV, but you do have one show that you ask for by name: Yo Gabba Gabba. It’s fun and full of energetic music that you like to dance to. You know all the characters’ names, and like to list them off at random times through the day. The episodes have some good messages, and it’s nice when you snuggle into my lap and we watch together. You’re not a snuggler, so it’s nice that for a few minutes, you’ll cuddle in, even if it’s just to watch a show. You talk a lot now, and most of the time you like to announce what you see, or are doing, or are playing with. You love to make animal sounds, and we go through your list of animal sounds in the car when the ride starts getting boring. I love being able to communicate with you, and you still like to sign, although now you sometimes do the sign and say the word at the same time. Daddy and I counted around 160 words that you know, which astounded us a bit. You’re an extremely clever little girl! You’re still a bit of a picky eater, and you still eat like a bird, but you’re able to handle bigger pieces of things, and you love to pick up a half a slice of toast in both hands and take a big bite out of it. We have to work hard at getting enough protein into you, but you love fruit and bread and sometimes you’ll even dig into your vegetables with gusto. You have your favourite foods, but singing the “Try it, you’ll like it” song from your favourite show will sometimes get you to try something new. There’s so much more, but this is getting quite long. I love you bunches and bunches, my little bean. I can’t wait to see what comes next. 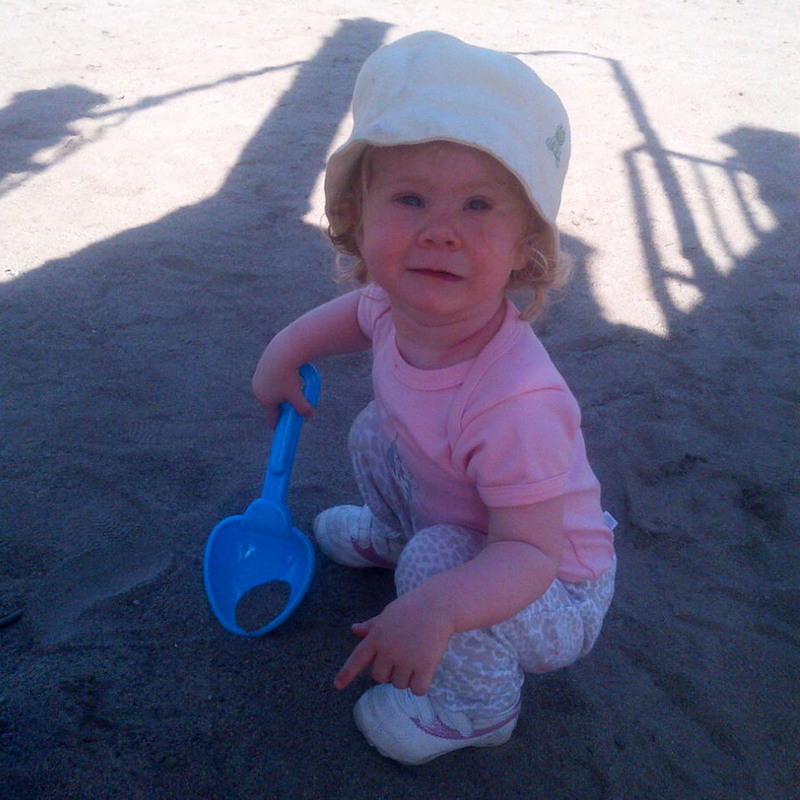 This entry was posted in Dear A and tagged 18 month olds, early language acquisition, gymnastics, playgrounds, playing, sand, yo gabba gabba on July 6, 2014 by lovelaughlaundry.